A monster that was Link Summoned using this card as material cannot be destroyed by battle or card effect for the rest of that turn. 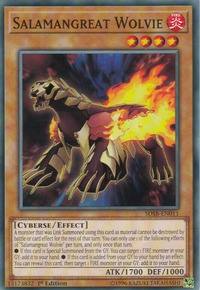 You can only use 1 of the following effects of "Salamangreat Wolvie" per turn, and only once that turn. ● If this card is Special Summoned from the GY: You can target 1 FIRE monster in your GY; add it to your hand. ● If this card is added from your GY to your hand by an effect: You can reveal this card, then target 1 FIRE monster in your GY; add it to your hand.